The holidays are synonymous with friends, family and food. However, with all of the fare and festivities comes the potential risk for food poisoning. This is important for the host as well as guests who may bring items to the party. Foodborne illness can ruin holiday fun, but the correct cooking and serving precautions can prevent it. Cooking safely requires a combination of care when preparing the food and following. Raw meat in particular contains a lot of bacteria that can be harmful if consumed. Therefore, taking the right steps is crucial. "Thoroughly cooking meat and poultry kills most bacteria." Start off by cleaning all surfaces and necessary utensils and tools in the kitchen to avoid cross contamination. When you start to cook, meat should be kept separate from other foods such as fruits and vegetables, the U.S. Centers for Disease Control and Prevention recommended. This means the knife and cutting board used to cut beef should not be handled to cut broccoli unless the utensils were washed in between tasks. For frozen meat, such as a holiday turkey, the CDC urged that thawing a turkey is not as simple as leaving it out on a counter for a day. 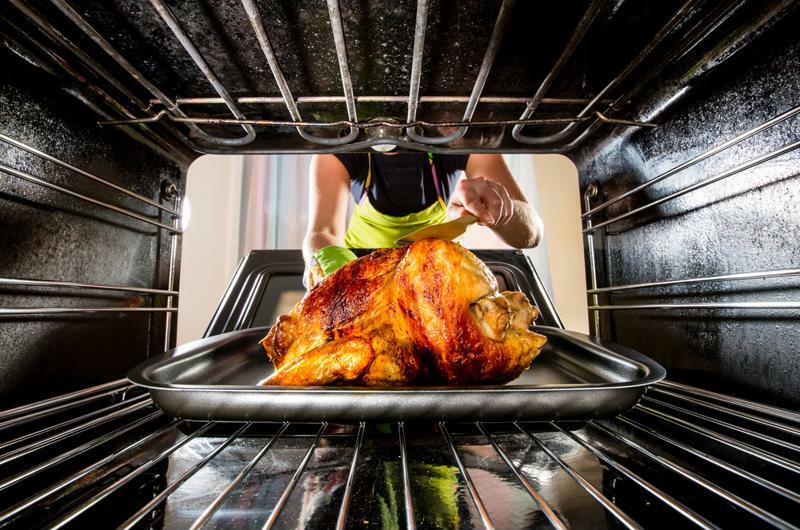 Thawing a turkey at room temperature for over two hours results in dangerous bacteria growth. Instead, thaw turkeys and other frozen meat in a refrigerator or in a sink of cold water. If thawing in a sink, change the water every 30 minutes. When it is time to cook, sterilize the areas where raw meat was prepared as to not contaminate other foods. The Illinois Department of Public Health said that most bacteria penetrate food as a result of incorrect care. The IDPH highlighted that overused wash cloths are often overlooked sources of bacterial growth. Thoroughly cooking meat and poultry kills most bacteria. However, if the meat does not reach a certain temperature in the cooking process, unwanted microorganisms will grow. The IDPH said that using a meat thermometer helps keep food safe. The thermometer should read anywhere between 145 to 180 degrees Fahrenheit depending upon the cut of meat or poultry. Typically, chicken needs to read at a higher temperature than other meats. Hosts also need to be mindful of the temperature of foods that contain eggs. These dishes, such as custards, casseroles, eggnog and sauces, should measure in at 160 degrees Fahrenheit, according to the IDPH. Use a meat thermometer to check the internal temperature of any meat or egg products you cook to ensure safety. Whether you serve your food at the table or buffet style, there are certain steps to take to ensure your hard preparation does not go to waste by bacteria ruining the food. NSF International, formerly known as the National Sanitation Foundation, said the key to a successful and microorganism-free meal is to keep hot foods hot and cold foods cold. Specifically, warm foods should maintain a temperature of 140 degrees Fahrenheit or hotter, and cold dishes should keep at 40 degrees Fahrenheit or cooler to avoid bacterial growth. Chafing dishes, warming trays and slow cookers are commonly used to keep food hot, while setting cold foods over ice will maintain a cool temperature during the meal. If the cold dish is not going to be consumed immediately, store it in a refrigerator or freezer for extra protection. NSF also suggested using small platters versus one large platter while serving. This way, when a small platter runs out, you can refill it with a fresh serving of food rather than having one large serving sit and breed bacteria. Finally, food should not be left out at room temperature for over two hours. If you plan to save anything, be sure to wrap it up and refrigerate it. If anything has been out longer than two hours, throw the food away because it is most likely contaminated with bacteria that can make you and your guests sick. The symptoms of food poisoning vary, according to the Mayo Clinic. However, people with a foodborne illness often experience abdominal pain and cramps, fever, nausea, vomiting and watery diarrhea. These symptoms can begin as little as a few hours after someone consumes the tainted food, or they can be delayed for days or weeks. The Mayo Clinic said to seek medical treatment if these symptoms cause extreme pain or last for more than three days. If you are ill from food poisoning, make an appointment or stop by a CareWell Urgent Care center for the best medical treatment so you can get back to enjoying every moment of the holiday season.